Stunning detail, elegant brushstrokes beautifully toned and soul-stirring. Katherine Kean paints sublime scenes of nature, storms, trees, birds, clouds, landscapes and more. Her oil artworks have so much depth and detail. 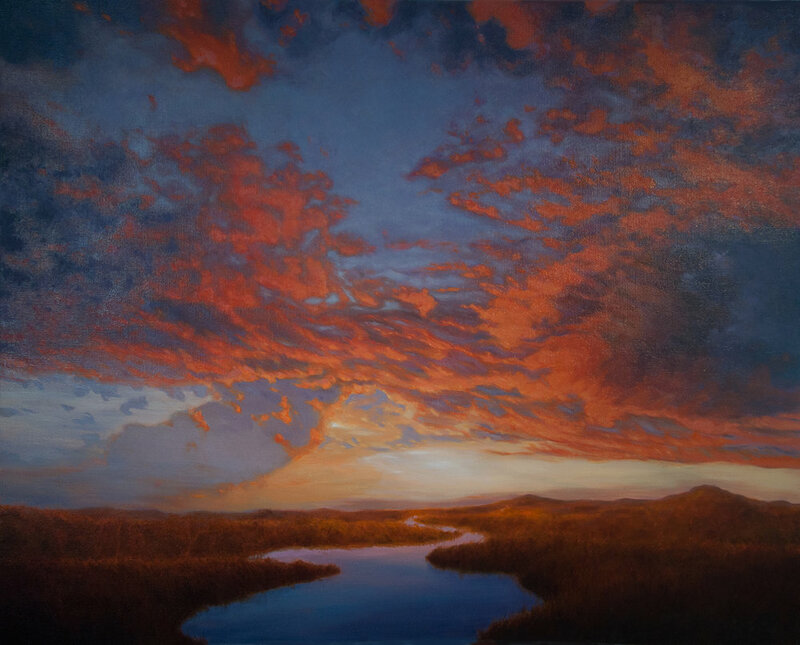 Katherine captures light beautifully within her clouds, land, and seascapes so that her art has an almost photographic realism, yet at the same time, she creates a gorgeous dreamlike atmosphere that is exquisite and rare. Her work evokes mood, emotion and a sense of wonder. Please talk a bit about where you are from and where you live now…. I was born in West Virginia and lived briefly in Ohio and New Jersey before growing up in Massachusetts. I live now in Los Angeles, having moved here after getting my BFA from Rhode Island School of Design to work in Special Visual effects for motion pictures. Art to me is at the very minimum a language that explores, stores, and communicates our experience. I also feel that art has the ability to transcend the day to day and make a bridge between past and present, between imagination and the temporal world. Like dreams, Art, quirt possibly carries messages to us from other realms. How did you discover your love for artwork? I don't know. I've made art one way or another for as long as I can remember. At times it has seemed magical to me, almost as if I feel on some level that if I can express something with pencil or paint, then I have somehow made it my own, whether it is a tree, a sky, or an emotion. How does your personality affect your work? I'm very introverted and idealistic. Art making gives me a means to process and communicate and attempt to balance my interior world with our physical reality. I am also curious and persistent, and I prefer to learn things first hand, rather than to be taught or told. This leads me to try new things and keep at them. I seem to be at my best artistically when I go out on a limb and get into trouble and have to paint my way out of it. Inspiration is everywhere. I'm most attracted to the natural world and I'm fortunate to live close to a wilderness area. I find the kinetic qualities of natural energy, such as wind, waves, or flocks of birds moving together, to be very exciting and I try to include the essence of this in my paintings. What do you like about oil paints? Once you know the rules of oil paint, about fat over lean and drying times and mediums, oil paint is very flexible and forgiving. You can work into it and on it and over it almost endlessly. It can be applied with texture and thickness or whisper thin. It can be opaque or transparent, It can be buttery or stretchy and stringy. Plus the colors are very rich and vibrant, and we know that they can last for hundreds of years. My list is very long indeed. I keep discovering new (to me) artists, both historical and contemporary. I love all the greats through art history (Da Vinci, Caravaggio, Rembrandt, Monet, Turner, etc.) for their courage and mastery and audacity and innovation, for learning about the characteristics of pigment and light, perspective, and scale, anatomy and drawing, composition and context. I admire the Romantic artists (Friedrich, Bierstadt, Stubbs, and so on) for their understanding of the importance of nature and their ability to evoke mood and for recognizing the problems and impact of industrialization early and calling attention to it, and the Tonalists that follow (Innes, Whistler, Ryder, and so many more) and early moderns (Dove, O'Keeffe, Pelton). I never tire of Van Gogh, and I love Klimt's landscapes and Charles Burchfield's landscapes. They all present the landscape along with what feels like the intangible energy of nature. Lately, I am curious about surrealists, especially Remedios Varo, because I have been working a bit with dream imagery which often has a surreal aspect to it. What advice would you give to a gifted artist who wants to exhibit their work? My advice is to create a body of work and get it noticed. Put up a website, make cards, carry them with you and hand them out, submit to artist calls to get into group exhibitions, post work on social media, join art groups and organizations and participate in their exhibitions. Don't be afraid to be humble and start small. Attend exhibitions and openings of galleries and artists you like and be professional. How do you manage your time in creating artwork and also being a successful business person in the art world? In an ideal world, I would focus on making artwork for extended periods of time, from several months to a couple of years without thinking about the business side at all. Then, when I've "finished", and thoroughly explored and painted and have new work that I'm excited about showing, I'd start to spend a little time promoting it, looking for exhibition opportunities, and so on. Once an exhibition is scheduled, I find I have a lot less time to spend painting, and it's more difficult to get into a flow of producing work when exhibition details demand attention. At this point in my art career, I'm not spending a lot of time thinking about the business side of the art world. When at all possible, I prefer to get out of the way and let art gallerists and art dealers take over the selling, and I try to keep my participation to a minimum. When I do have to jump into the business end, I compartmentalize my time. This way of handling my time may not work forever, but it is how I am doing it right now.